Of all the types of debt you can hold, credit card debt is one of the nastiest. NASDAQ reports that consumers pay an average of 15% on credit card debt, and those with a revolving balance tend to pay even higher rates. Many Americans have revolving balances spread across several cards, making the repayment process even more hectic and difficult. If you’re struggling to pay off your balances, understanding your monthly budget, prioritizing your credit card payments, and using tools to lower your interest rate can help you form a realistic plan to become debt-free. Here are five steps you must take to achieve this goal. You may not feel there’s room in your budget to make larger credit card payments, but if you’re serious about being debt-free, you’ve got to make some changes. To free up cash to pay down your credit card debt, you must try to cut your costs, increase your income, or both. Utility Bills. Gas and electric are especially important. Adjust your thermostat, turn off office equipment when you’re not home, lower your water heater thermostat, install inexpensive motion sensors on lights, and install weather stripping and window coverings to lower your bills. You can also use a solar cover on your pool to reduce energy costs, and turn off your hot tub completely when you’re not using it. Wash your clothes with cold water rather than hot, and line-dry them instead of using your dryer. Only run your dishwasher when it’s completely full, or opt to wash dishes by hand. Cable Packages. Are you willing to cut your cable package and use a low-cost alternative like Netflix, Amazon Prime, or Hulu? If you can live without live televised shows and sporting events, you can save hundreds of dollars over the course of the year. Eating Out. Dining out or going out for drinks can add up quickly. Eat more meals at home, and host gatherings at your house rather than at the local bar. Elective Purchases. You don’t have to stop all elective purchases, but you can be more strategic about when and how you splurge. Look at your spending on clothing, accessories, electronics, hobbies, and entertainment. Before you pull the trigger on any item, ask yourself, “Do I really need to make this purchase, or can I get by without it?” If it’s not something you truly need to buy, don’t. Hopefully, you can find enough excess in your personal budget that you can cut down on expenses and still maintain your current lifestyle. If you find it’s not that easy, you may need to take more drastic measures. Taking on a roommate or moving to a shared living situation can easily save you hundreds of dollars on housing expenses. If you live in a bike-able area with a good public transportation system, or if your significant other has a reliable vehicle, ditching your car can save a ton on gas, maintenance, repairs, insurance premiums, registration, and loan payments. Remember, it’s only temporary until you’re debt-free. Become a Mystery Shopper. Mystery shopping companies such as TrendSource and Coyle pay you to evaluate businesses, hotels, and restaurants. Use Your Talents to Freelance. If you’ve got an in-demand skill (such as writing, graphic design, marketing, web design, accounting, or photography), do it on the side for cash. Set up a website for yourself and create a profile on freelancing sites like Contently and Guru. Browse job ads on websites like Craigslist or Freelancer to find gigs. Do Odd Jobs. You don’t have to be an expert to clean, babysit, tutor, move furniture, wash cars, or do yard work. Advertise your services on a website like Craigslist or Thumbtack. Sell Stuff. Get rid of your used books, clothes, and household items, and make some money doing it. eBay, Craigslist, secondhand stores, and consignment shops are all potential platforms to sell your things. Budgeting is no one’s favorite pastime, but you’ve got to create a realistic debt management plan. Write down your monthly net income and subtract your budgeted expenses from that number. Based on this calculation, designate a specific dollar amount you can use to pay your credit card balance each month. Be sure to leave a little wiggle room in your budget for fluctuations and emergencies. For example, if you have $600 remaining after meeting your budget obligations, consider designating $400 to credit card payments and leaving a $200 buffer for unexpected expenses. Keep this in a safe, liquid account that you can easily access (such as a savings account or a money market account that allows regular withdrawals) so you can take it out if necessary. The higher your designated repayment amount, the sooner you can get out of debt. That’s especially true because of compounding interest on your credit card balance. Any interest expense that you accrue on your credit card balance is compounded into your next month’s balance. This means that if you’re not paying off your full balance, you’re paying interest on your interest. Plus, to avoid fees, your monthly payment must meet or exceed the minimum payment imposed by your bank. As you continue to make payments, your minimum monthly obligations decrease. Don’t be tempted to decrease your actual payment when this happens, as paying only the minimum won’t make a serious dent in your principal balance. Making higher payments can save you thousands in interest and can mean you’re debt-free years – or even decades – sooner. It’s hard enough to tackle credit card debt without exorbitant interest rates eating into your principal repayment amount. To get your debts paid down faster, look for ways to decrease the interest rates on your cards. 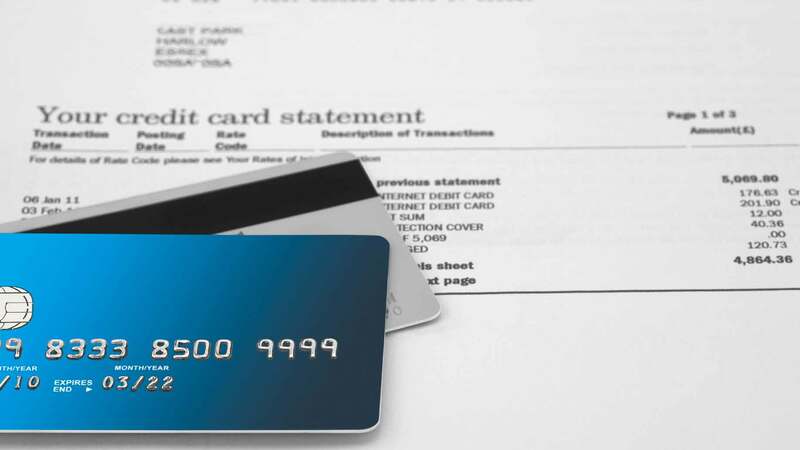 To get your business, many credit card companies offer balance transfers on new credit cards. A balance transfer is when you “pay off” one card by transferring the outstanding balance to a different credit card. If you have a good credit score, you may be able to qualify for a new card that offers a 0% balance transfer in which you pay no interest on the balance for a predetermined period of time. Taking advantage of a 0% balance transfer can save you a great amount of money in interest fees if you were paying a high interest rate on your old card and maintained a significant balance. However, what can make balance transfers dangerous is the fact that your introductory offer of 0% expires after a certain amount of time. After the introductory period, which generally lasts between 12 and 21 months, the interest rate reverts to the card’s standard APR. Read the fine print and find out what your interest rate becomes after the promotional rate expires. If it’s higher than the rate that you’re currently paying, think seriously about whether the balance transfer offer is worth it. To use a balance transfer successfully and avoid excessive interest charges, budget to pay off the entire transferred balance during the introductory period. Before you agree to a transfer, take a look at the balance transfer fees, which are one-time fees assessed on the amount that you’re transferring to the credit card. For example, if you’re transferring a $5,000 account balance and the credit card company assesses a 3% transfer fee, it costs $150 to transfer the balance. Balance transfer fees of 3% or 4% are common, although you can find 0% balance transfer fee offers once in a while. Debt consolidation entails consolidating multiple sources of debt – such as multiple credit cards, student loans, auto loans, and mortgages – into one loan. The biggest benefit of debt consolidation is that it simplifies your obligations. You’re only responsible for one payment every month, so you’re less likely to forget a payment and get hit with late fees. You may also be able to reduce your total monthly payment for all your obligations by agreeing to a long-term loan. Like balance transfers, consolidating your debt doesn’t reduce or eliminate it. It is possible to consolidate at a lower interest rate than what you’re currently paying, which can save you money. However, the U.S. Consumer Financial Protection Bureau warns that, as with balance transfers, many debt consolidation lenders offer low teaser rates that convert into a sky-high APR later. Many consolidation loans also require an up-front fee to consolidate your debts or charge a recurring monthly fee on top of your regular payments. If you do opt for debt consolidation, do your research and find a reputable company to work with. Experian warns consumers that some unscrupulous debt consolidation companies may instruct you to refrain from paying bills or delay payments to your creditors, which can seriously damage your credit score. To avoid this type of situation, the Consumer Financial Protection Bureau recommends that you work with a credit counselor before you agree to debt consolidation. You can find a list of approved credit counselors by state on the U.S. Department of Justice website. Interest Rates. Snagging a lower rate reduces the interest charges you accrue on your balance. Minimum Payment Amount. Negotiating this can help you avoid fees if you can’t meet your minimum payments certain months. Payment Plans. They’re not easy to negotiate, but credit card companies do allow consumers to cease payments for a certain period of time or set up a long-term payment plan at reduced interest rates. Some credit card issuers offer built-in payment plans, such as Chase Blueprint, which allows you to easily adjust your payment structure and even pay some charges without interest. Call your credit card company’s customer service line to ask about your options. Be persistent and be prepared to escalate the issue. You may need to get a manager involved to make any significant changes to your credit card terms. If the bank does agree to the change, be sure to get a copy of the agreement in writing. You can negotiate with the bank yourself, or you can ask a nonprofit credit counselor for help. Once you’ve determined how much you can allocate toward credit card repayment and you know your card interest rates, decide how you’re going to pay off the debt. Most credit card repayment strategies involve “stacking” your payments, or paying off one credit card at a time. One popular stacking strategy is to focus your effort on your highest APR credit card while only making the minimum payments on the other accounts. For example, say you have one credit card with a $4,000 balance at a 12% interest rate with a $80 minimum payment. You also have another account with a $4,000 balance, an 18% interest rate and a $100 minimum payment. If you only have $400 per month to put toward credit card payments, what are your options? Employing the stacking method, you would make the $80 minimum payment on your 12% APR card and designate the remaining $320 towards the 18% APR card. Once the 18% APR card is completely paid off, you would put your full $400 toward the remaining balance on the 12% APR card. Remember – the higher the percentage rate, the more interest expense you’re accruing on an outstanding credit card balance. Tackling your high APR cards first allows you to avoid excessively high interest payments and helps you pay less overall to get out of debt. Although paying down high APR accounts makes clear financial sense, it may not work best in practice. Paying off multiple credit card debts can be an overwhelming endeavor – it’s easy to get frustrated and revert to old habits. Because of this, some personal finance experts advocate the “snowball” method instead. Under this method, individuals pay down the smallest debt first, no matter what the interest rate is. For example, say you have one credit card with a $2,000 balance at a 15% interest rate with a $50 minimum payment. You also have another card with a $4,000 balance, an 18% interest rate and a $90 minimum payment. Again, you have $400 every month to repay your debts. With the “snowball” strategy, you would pay the $90 monthly minimum payment toward your $4,000 debt, and put your remaining $310 toward the $2,000 debt. Once you pay off your $2,000 debt, you can devote your full $400 to the $4,000 balance. Note that although the $2,000 debt had a lower interest rate, it was paid first. That’s the “snowball” strategy – start with your smaller debts and work your way up. With this method, you have the ability to see a $0 balance much quicker, and it’s a great feeling to finally see an account balance completely wiped away. Successfully paying off one account can give you a sense of accomplishment and more motivation to tackle bigger, badder credit card debts that are going to take much more time to pay down. Alternatively, there’s no rule against combining the stacking and the snowball methods. If you have two accounts that have similar balances but one has a higher interest rate, you may want to tackle the more costly debt first, even if it’s a bit more. For example, if you’ve got one card with a $2,000 balance and a 20% APR, and another card with a $2,500 balance and a 12% APR, you may want to target the 20% APR card first. Even though $2,500 is a slightly larger debt, the 20% interest rate is going to catch up to you quickly, so it’s best to pay that down first. The last thing you want is to successfully pay down your card balances, only to find yourself in debt again months or years later. Change the way you handle your finances and the way you think about money in order to keep yourself out of trouble. Reformed shopaholics traditionally cut up their credit cards to avoid further temptation, and there is some sound logic behind this practice. Consumers tend to spend more with a credit card than with a debit card, and more with a debit card than with cash. Any type of card can feel less “real” than cash, and credit cards, which don’t hit your bank account at all, can feel like play money. It’s a bit impractical to cut up all your plastic in this day and age. 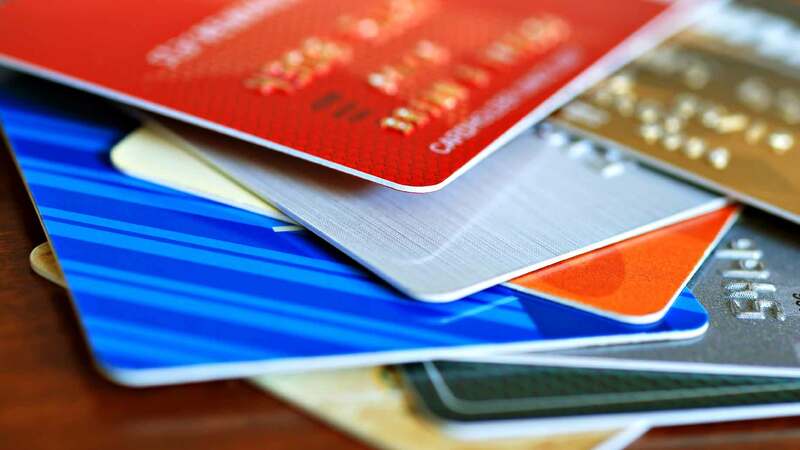 You need a debit or credit card for many major purchases, and they are often essential for purchases made online. Still, you can resist temptation and stick to your budget by using the envelope budgeting method for discretionary purchases. To use the envelope budgeting method, pull out a certain amount of cash each month and stick it in an envelope. Use that instead of your credit card for non-essential purchases. When the money’s gone, you’re done for the month. If any cash is left over, you can put it toward your credit card repayment or deposit it in your emergency fund. It’s easy to lose motivation when you’re dealing with a large debt. Tracking your progress is one way to keep yourself excited and focused on what you’re accomplishing. Mint, a personal finance program, allows you to set goals for yourself (paying off a credit card is one of them), which can help solidify your commitment. Dave Ramsey also offers a debt feature that helps you track your progress. Alternatively, you can track your spending progress offline. Save your receipts and record other purchases in your check register. At the end of the week, categorize the expenses into your budget categories. Seeing how far you’ve come can motivate you to stay the course. Find an accountability buddy and keep each other up to date on your financial progress. This could be a significant other, close friend, or family member. Talk on a regular basis – maybe once a month or every two months – about what repayments you’ve made on your credit cards. The online debt reduction program ReadyForZero has an accountability function that sends updates of your debt reduction progress to specific friends and family. It can be uncomfortable to talk about finances, but it gives you more motivation to stick your goals. Digging yourself out of credit card debt isn’t easy. To do it successfully, you’ve got to change your financial behavior and prioritize where you spend your money. It may take some time to get used to the changes, but ultimately you gain money management skills that can help you live a financially savvy life for years to come. Have you paid off a large sum of credit card debt? What tactics and strategies helped you succeed?